Decades ago, Montana was pigeonholed as a desolate place. To a degree, that may still be true, but only to those ignorant of its natural bounty. Montana is among the very best states for sportsmen, most importantly including the diehard cyclist. The contrast of topographic ruggedness and Mother-Earth welcoming is impossible to ignore for the avid cyclist. It’s simply a bike enthusiast’s paradise! Next time you’re looking to get a tune up or grab a new set of wheels, check out these 10 premier Montana bike shops. The Flathead Valley endures as natural-beauty magnet, drawing in explorers and tourists and entrepreneurs for centuries. The unique topography has both spawned and necessitated top-notch cycling enthusiasts and experts. For nearly 40 years, this cyclery has met and exceeded the standards of a highly demanding populace. With knowledgeable staff, premier facilities, and parts, and a host of rentals, replacements and demos, this bike haus is uber-awesome. 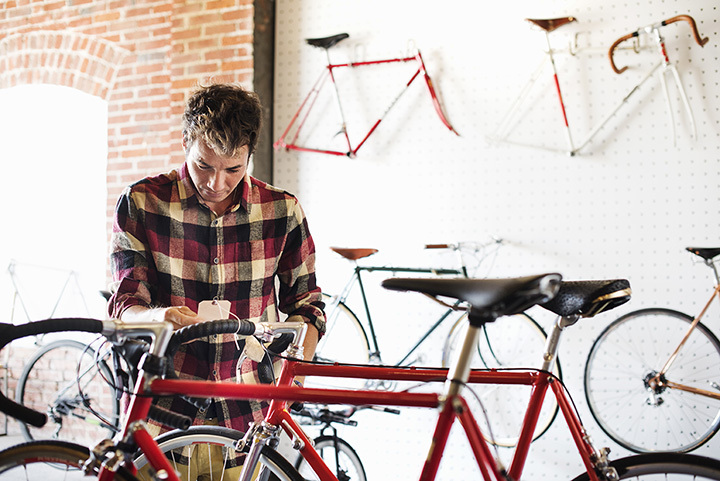 This bike shop prides itself on heritage, both of its brand and its building. Since 1879, a lineage of Ace Hardware, this tool-packed repair mecca has served its constantly changing, but consistently outdoorsy, clientele. This place has all the amenities and tools to bookend its familiar and enthusiastic staff. Owenhouse’s dedication to down-to-earth professionalism and the quality of its product are its two greatest assets: every bike sold comes with a 30-day, no-questions-asked warranty. Can you say busy?! @treadyshreddyj and I are cranking out repairs like there's no tomorrow. I love my job. Como que andamos ocupados en el taller! Amo mi empleo. Butte is an ideal example of the many Montanan towns rising from their industrial-era economies, embracing (perhaps begrudgingly, to some) influxes of locals and tourists seeking forest bathing via outdoor recreation. Bad Beaver is the ideal name for this shop. It’s obviously tongue-in-cheek, but still proud of its rural-mountain roots. The shop-keeps are friendly and highly industrious—bringing a level of expertise and small-town approachability that makes for an easy repair or purchase. Easily the best in town, if not the area. Great Northern is a rare case in which breadth hasn’t undermined depth. Put simply, this shop actually specializes in a few things: bikes, skis and coffee. And it does them well. Now celebrating its tenth year, and having been passed on to a pair of dedicated employees, the spirit and tangible cycle-enthusiasm remains. Where many ventures spread themselves too thin, this shop amalgamates the best aspects of its passions, all steering them towards a quality customer experience (whether that means a well-suited and affordable ride or an expertly-frothed morning joe). Great Divide is a clean, well-stocked and shiny shop. It’s one that pleasantly toes the line between gear & jargon for the pro-rider, and exciting, sleek and practical rides for the first-timer. The small, laid back staff is deceivingly knowledgeable, and their obvious passion for the sport is contagious. The shop’s intimate shopping/learning experience is bolstered by its focus on the “Right Fit:” like suits, so many bikes are ill-fitted—and most riders wouldn’t even know it. Needless to say, we're excited! The #nomadv4 and #strega from @santacruzbicycles and @julianabicycles are some truly amazing bike, both in looks and performance. Come down to the shop and give them a look. We have every color in stock today! Missoula is an ideal representation of Millennial Montana: it’s a hip university town, but without the hidden behemoths of celebrity retreats (a la Bozeman), it’s food-centric but still not completely vegan and the housing is still affordable for locals and out-of-staters alike. The Missoula Bicycle Works is comparably electric. Started from two enthusiastic college-student bike-lovers, the shop is professional, but affordable, the staff is experienced, but approachable, and the vibe is cycle-centric, but without pretense. Competency and expertise are the most important traits for a good local bike shop. But friendliness and individual customization are welcome icings on the cake. The Spoke Shop certainly focuses on substance, not garnish. Its interior space is minimalist, and certainly not gilded. And this couldn’t be more welcome. Don’t let this mislead: it’s a beautiful shop. But it chooses to focus on the basics, the essentials (not unnecessary flourishes that may belie an inattention to real (bike) detail). It looks like a professional bike garage: no frills, just approachable professionals practicing their craft. And one’s bike will be thankful. The Garage is the place in Montana for some stellar bicycle craftsmanship. These artisans dedicate themselves to the finest frames and parts, creating pieces of mobile fine art. All that said, these experts can easily provide top-notch maintenance, tune-ups and sales. So be it for high-end art, or low-end repair, this garage is one of few worth remembering. Service, rentals, and sales….Anything the cyclist needs on the fly is here at the ‘Hangar. At the southern entrance to Missoula, this shop is easily accessible from the highway, and efficient enough for quick turnaround on basic repairs. This casual shop is approachable in the best way, and knowledgeable enough to accommodate the traveling family needing last-minute parts or the seasoned expert seeking a performance tune or piece of cycling esoterica. This is a downright charming, locally-owned biking institution. But this “small-town” charm doesn’t mean a casualness towards the staff’s expertise and passion for quality craftsmanship. And this shop’s success is a testament to its quality, given the demanding Bozeman citizenry: both in terms of its passion for the outdoors, and for the often deeper-than-the-average-Montanan’s pockets.